John W. Housley has extensive experience in local government law, civil rights defense, commercial litigation, creditors’ rights and collections, real estate law and class actions. John’s practice involves representation of numerous local governments: he is the county counselor for Greene County and Christian County. He represents elected officials in Webster and Christian County’s. He is the city attorney for Fair Grove, Missouri and represents numerus E-911, senior services and disability boards throughout Southwest Missouri. In addition, John has represented the City of Springfield in both state and federal court litigation. 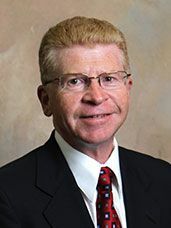 In his thirty five years of practice, John has handled numerous appeals to the Eighth Circuit Court of Appeals, the Missouri Supreme Court and the United States Supreme Court. In addition to his experience representing local governments and businesses, John has an extensive practice in planning and zoning litigation and has been instrumental in the development and enforcement of Greene and Christian County’s zoning ordinances and building codes. Mr. Housley is a Missouri commissioned Peace Officer and has been a Christian County Deputy Sheriff for the past twenty three years. He regularly defends Sheriffs and Deputies in state and federal court litigation. He has drafted policy and procedure manuals for the Greene County and Christian County Sheriff’s Departments, as well as represented other sheriff departments in defending employment issues. He is a POST certified instructor and regularly conducts seminars for law enforcement officers. He has been a speaker at numerous seminars and annual meetings for the Missouri Association of County Commissioners, the Missouri Recorder’s Association, and the Missouri’s Sheriffs Association. John serves as pro bono counsel for the Pregnancy Care Center. He is on the Board of Directors of the Springfield Landmarks Preservation Trust and the Springfield Executive Breakfast Club. He is also the Chairman of the Board of Trustees of Second Baptist Church in Springfield, Missouri. Lowther Johnson Attorneys At Law, LLC is located in Springfield, MO and serves clients in and around Springfield, Branson, Bolivar, Brookline Station, Buffalo, Turners, Strafford, Billings, Clever, Willard, Republic, Bois D’Arc, Walnut Grove, Stockton, Cassville, Fair Grove, Nixa, Galena, Ozark, Highlandville, Ash Grove, Halltown, Rogersville, Marshfield, Lebanon, Camdenton, Oldfield, Fordland, Sparta, Barry County, Camden County, Cedar County, Christian County, Dade County, Dallas County, Greene County, Laclede County, Lawrence County, Polk County, Stone County, Taney County, Texas County, Webster County, Wright County, and other cities and counties throughout Missouri and Northwest Arkansas.